Heather Davis is a researcher and writer from Montreal. She recently completed her Ph.D. in Communication at Concordia University on the political potential of community-based art. She explores and participates in expanded art practices that bring together researchers, activists, and community members to enact social change. Paige Sarlin is a filmmaker, scholar, and political activist. She has an M.F.A. in Film/Video/New Media from the School of the Art Institute of Chicago and she received her Ph.D. in Modern Culture and Media from Brown University in May 2012. The title of her dissertation is “Interview-Work: The Genealogy of a Cultural Form.” Her first feature documentary, The Last Slide Projector, premiered at the Rotterdam International Film Festival in 2007. A longer version of the article printed here entitled “Better Left Unsaid? The Vulnerable Accumulation of Being-in-Common” will appear in a special issue of TDR in the fall of 2012. Ayesha Hameed is a Visiting Researcher at the Centre for Research Architecture at Goldsmiths, University of London. Her practice which includes performance, video and writing, examines contemporary borders, migration and detention. Eddy Kent is an Assistant Professor of Victorian Literature and Culture in the Department of English and Film Studies at the University of Alberta. He has published essays on, among other things, Rudyard Kipling, Hanif Kureishi, William Morris, and political violence. He is currently completing a monograph on corporate culture and the British Empire. Jackie Calderwood is a media artist and doctoral researcher with the Institute of Creative Technologies, De Montfort University, UK, specialising in co-creative interactive media. Jackie’s practice-based thesis ‘Pervasive Media for Eudemonia: Transdisciplinary Research by Practice’ draws on her locative, online and event-based artworks. Her research interests spring from freelance practice in sculpture, video, community arts, holistic massage and her love of the rich processes of the natural environment. The Edmonton Pipelines Project is a research cell composed of faculty, students, and community partners who are developing new urban narratives through multimedia and deep mapping. Pipelines seeks to channel this narrative understanding through dense city space via urban stories that come “from below” — from marginalized communities, from forgotten histories, or from everyday people making ordinary lives in a city that does not always make such living easy. The project is led by four University of Alberta faculty members: Daniel Laforest and Russell Cobb (Modern Languages and Cultural Studies), Maureen Engel (Humanities Computing), and Heather Zwicker (English and Film Studies and Vice Dean, Arts). Elske Rosenfeldworks and lives in Berlin and is currently enrolled in the PhD in Practice program at the Academy of Fine Arts in Vienna and a recipient of a DOC-Fellowship of the Austrian Academy of Sciences. Her work explores different methodologies – installations and video, writing and talks, workshops and events – to refocus the diverse historical positions of criticality and dissidence within the different state socialisms of the former Eastern bloc and, in particular, the upheavals of 1989/ 1990. Using her own biographical experience as well as other materials and stories that often brush up against the dominant representations of those histories, her works aim at creating constantly reassembling communities of discussion and contestation though which the obscured political potentials of those histories might re-emerge. Imre Szeman is Canada Research Chair of Cultural Studies at the University of Alberta. 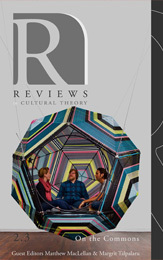 Recent publications include Cultural Theory: An Anthology (co-ed, 2010), After Globalization (co-author, 2011), and Contemporary Literary and Cultural Theory (co-ed, forthcoming 2012). His current project is a book on the cultural politics of oil and energy. Adam Katz is a Ph.D. candidate in the Buffalo Poetics Program. His current interests include philosophy, experimental poetry, early Buddhism, and pedagogically transmitted inspiration. Eleanor King presents installations and performances nationally and internationally, most notably at Nuit Blanche (TO), Art Gallery of Nova Scotia, Eastern Edge Gallery (NL) and Galleri F15 in Norway. She received a BFA from NSCAD in 2001, and has participated in residencies at The Banff Centre, Atlantic Centre for the Arts (FL), New Adventures in Sound Art (TO), and CFAT (NS). Inspired by the everyday, Eleanor’s work employs interdisciplinary strategies for site-specific installations. She is a current nominee on the Sobey Art Award long-list, teaches media arts at NSCAD University and is Director at Anna Leonowens Gallery in Halifax, Nova Scotia. Henry Adam Svec makes performance art, writes songs and fiction, and works on a PhD in Media Studies at the University of Western Ontario. He has presented work at Nuit Blanche (upcoming), FADO, 7a*11d, Rhubarb, Eastern Edge, and Sappyfest, and his most recent projects (Folk Songs of Canada Now, The CFL Sessions) combine folksong collecting and the mass-mediated hoax. His creative work has bled into his research—academic interests include authenticity, utopia, and media archeology. Henry’s scholarship has been published in Loading…, Celebrity Studies, and Popular Music and Society (forthcoming), and his first short story recently appeared in The New Quarterly. Aileen Burns is a curator and writer based between Derry and Berlin and is currently Co-Director of CCA Derry~Londonderry. She holds an MA in Modern Art: Critical and Curatorial Studies from Columbia University. Independently and collaboratively, Burns has curated projects for Bergen Kunsthall, Bergen; FormContent, London; InterAccess, Toronto; Justina M. Barnicke Gallery, Toronto; Overgaden, Copenhagen and Stiftelsen 3,14, Bergen. She has worked with artists such as Geoffrey Farmer, Luca Frei, Melanie Gilligan, Runo Lagomarsino, Olivia Plender, Superflex, and Alexandre Singh and held positions at the Whitney Museum, Miguel Abreu Gallery, Corkin Gallery, Mercer Union, and the Justina M. Barnicke Gallery. Her writing appears Art in America, Art Papers, Canadian Art, C Magazine, as well as numerous books and catalogues. Johan Lundh is a curator, writer and translator, presently dividing his time between Derry~Londonderry and Berlin. Currently, he is Co-Director Centre for Contemporary Art Derry~Londonderry. Lundh holds a MFA and a post-graduate degree in curating from Konstfack in Stockholm. He is a member of the International Association of Curators of Contemporary Art, IKT, and has curated exhibitions and events for such organizations as Bergen Kunsthall, Bergen, Index, Stockholm, Konsthall C, Stockholm, Overgaden ICA, Copenhagen, and Western Front, Vancouver. In the past, he has worked with, for example, Bik Van der Pol, Runo Lagomarsino, Olivia Plender, Alexandre Singh, and Superflex. Lundh is a member of the International Association of Art Critics, AICA, and his writing and translations has appeared in publications such as Art Lies, Art Papers, Fillip, Metropolis M, Mousse, Paletten, Yishu, as well as exhibition catalogues and artists’ books. In addition, he has lectured extensively at universities, residency programmes, and exhibiting venues across Europe and in North America. Sarah Banting’s research interests include the rhetoric and pragmatics of style and genre, the rhetoric of writing in the academic disciplines (especially literary criticism), and the literary narration of urban space. She completed her doctorate at UBC in 2010 and will take up a position as Assistant Professor at Mount Royal University in August, 2012. She is a city girl, an avid theatre-goer, and an active volunteer in performing arts administration. She loves to dance. Tess Takahashi is Assistant Professor in the Department of Film at York University in Toronto, where she teaches classes on technologies of the image, experimental film, documentary, and animation. She is currently revising her award-winning dissertation, Impure Film: Medium Specificity and Intermediality in the North American Avant-Garde (1968-2008) for publication as a book. Christine Stoddard is an interdisciplinary artist/scholar and occasional university instructor. She has a Ph.D. in Art History and Visual Studies from the University of Manchester, UK, specializing in contemporary performance. Her current research is focused on thinking about embodied forms of belonging, the affective experience of alterity, the politics of risk, cultures of pain, and the ethics of hospitality as they play out in intimate life and on the public stage—themes she recently explored while curating an online exhibition on queer performance in Vancouver at Grunt Gallery. As an artist, christine’s creative practice is primarily collaborative, exploring embodied forms of expression, often with the cross-disciplinary group Proximity Arts. Cayley Sorochan is a doctoral candidate in Communication Studies at McGill University. Her current research is concerned with the ideological function of discourses and practices of “participation” in online culture, political organization and consumer capitalism. Her wider research interests include urban theory, the politics of space, networked performance, spectatorship, and mobile/social networking technologies. Leanne Zacharias is a dynamic cellist, interdisciplinary collaborator and performance curator. Breaking trail in the post-classical genre, she collaborates with artists of all stripes; songwriters, composers, choreographers, writers, architects, visual and performance artists. Curator of the Music for Spaces project and leader of the Correction Line Ensemble, melding contemporary chamber music and narrative songwriting, she performs regularly with new music groups across North America and creates sound and performance installations internationally. Based in Manitoba, Dr. Zacharias is on faculty at the Brandon University School of Music. Ashley Wong is a cultural worker, artist and researcher based in London, UK. She has a BFA in Digital Image/Sound and the Fine Arts from Concordia University in Montreal and an MA in Culture Industry at Goldsmiths University of London. She is co-founder of DOXA, an international research collective. Through an on-going project on ‘creative space’ she continues to organize discussion events, publish and participate in conferences internationally on community, art and the economy between UK and Hong Kong / China. Her work has been presented in Rencontre Internationale (Paris/Madrid/Berlin), HK/SZ Biennale of Urbanism and Architecture 2009 (Hong Kong), The European Congress on Aesthetics (Madrid) and This is Not a Gateway (London). Matthew MacLellan is a PhD candidate in the Department of English and Film Studies at the University of Alberta. His doctoral research examines the shifting morphology of “culture” and “economy” within contemporary literature on post-industrialism or post-fordism. His work has appeared inPolitics and Culture, The John Hopkins Guide to Literary Theory and Criticism, Reviews in Cultural Theory, Mediations and Rethinking Marxism. Margrit Talpalaru conducts research in cultural studies, with an emphasis on media, contemporary literature, and corporate capitalism. She is currently completing a manuscript titled Capitalism Now: From Corporatism to Alternatives, which relies on Gilles Deleuze and Félix Guattari in its examination of the nature of corporate capitalism through the lenses of corporate culture, media, literature, and non-fiction. Her most recent research project investigates the collusion of the increasingly popular phenomenon of charitable giving with corporate capitalism.